The Account Termination Notification Letter is to be sent out as a final statement to a customer who has not resolved their past due account that their account has been suspended or terminated in 72 hours. This Account Termination Notification Letter is included in editable Word format that can be customized in Word or by using the included Wizard software. How do you write a Account Termination Notification Letter document? Re: NOTICE OF TERMINATION AND 72 HOUR DISCONNECTION NOTICE. Please be advised that your account with Company Name will be terminated in 72 hours due to non-payment. To prevent account termination, you must contact our billing department immediately at Insert contact information here to pay your overdue balance. If we have not received payment within the next 72 hours, all services provided to you by Company Name shall be terminated and all related access and/or services will be suspended. Account reactivation or restoration fees. In order to avoid the additional costs of added interest, collection fees, and court costs, and to help preserve your credit rating, we suggest that you resolve this matter immediately. 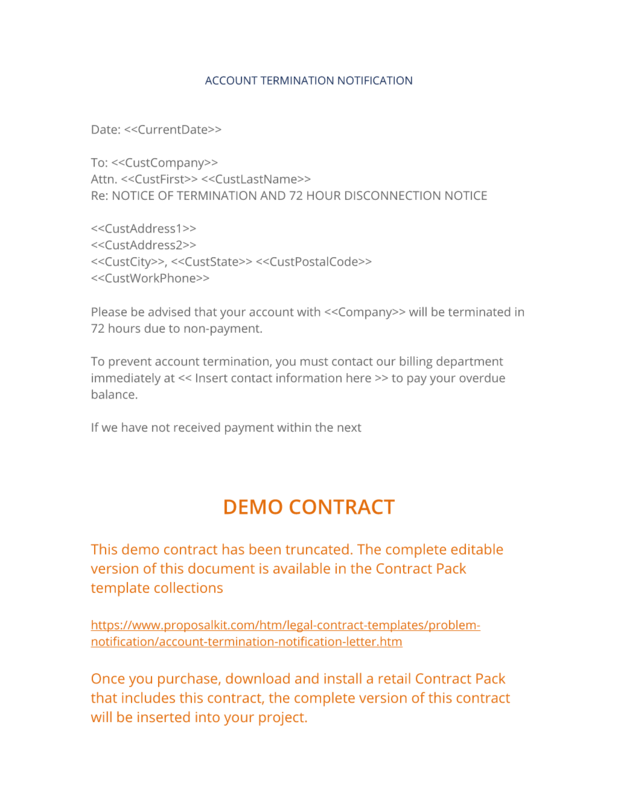 The complete Account Termination Notification Letter - with the actual formatting and layout - is available in this Contract Pack.